Crawley defender Paul Connolly has been suspended for five matches following an altercation with a fan during last week's 1-0 defeat at Brentford. The 30-year-old can appeal against the ban, which was imposed by an independent regulatory commission. Connolly was charged with violent conduct last week, with the FA declaring that the standard three-game ban would be "clearly insufficient". The right-back accepted the charge but contested the length of the suspension. 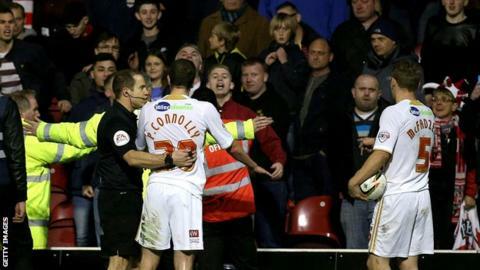 The incident at Griffin Park came in the 90th minute of the game, when Connolly appeared to raise his arm towards a Bees supporter after the ball was thrown at him from the stands. It was not seen by the match officials but was caught on video. Former Derby, Leeds and Millwall man Connolly joined the Reds in February and has made six appearances for them. If Connolly decides to accept the length of the suspension he will miss the rest of the campaign.